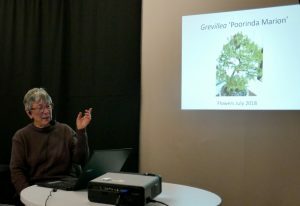 The Club’s August meeting featured a fascinating presentation by Ruth McLucas on her experience with Grevilleas as bonsai. 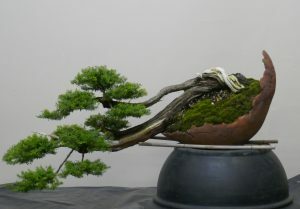 Ruth is an experienced and thoughtful bonsai artist, with her knowledge and expertise covering a wide range of species, both exotic and native, over quite a few years! And what a good night it was. Grevilleas come in an extraordinary range of plant forms, leaf structures, flowers, and habitats, with continual development of new varieties by the nursery industry across Australia. 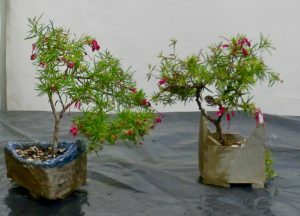 The possibilities of growing Grevilleas as bonsai seem endless, but it is not one of the most frequently-used plants in the bonsai world. 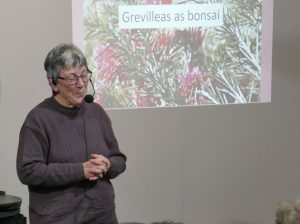 Ruth’s presentation, accompanied by a great selection of photos, covered all the essentials for using Grevilleas as bonsai. Ruth discussed the wide variety of flower types, the extensive foliage variations, and the growth habits which can be found in this genus. From there, Ruth expanded the discussion into the essential growing conditions for Grevilleas, and the pruning and wiring techniques which are appropriate for these plants. 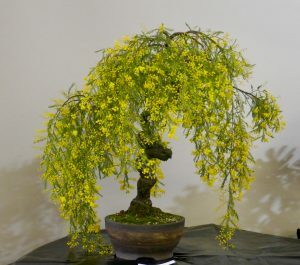 Repotting and watering requirements were outlined, and then examples of a number of Ruth’s favourites, from relatively rare species to readily available varieties, were highlighted. 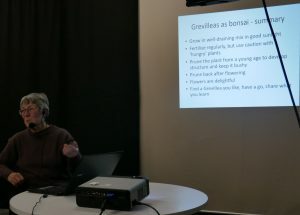 This was a night which stimulated many ideas for bonsai, and inspired a number of members who hadn’t previously used many (or any) Grevilleas to broaden their horizons. Many thanks to Ruth for sharing her inspiration and knowledge.